CLOSED "Bistrot" has officially been added to the name and a new chef--Rodolfo Castellanos Reyes--is now on board, but the atmosphere and delicious fare remain, thank goodness. I also discovered that if you can get here before 6 p.m., you might actually be able to walk in and sit down. Having a reservation is still advised. 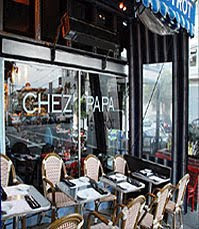 As part of San Francisco's Dine Around Town program, a special $34.95 three-course menu is available through June 15. I selected a all-vegetable cauliflower soup, the always-spectacular and tender lamb daube, and a creamy panna cotta that subbed for my choice of lavender creme brulee, which they were out of. Our knowledgable waitress selected the wine and she definitely knew her vintages. I can't wait to return to this little gem on the hill. If you visit every page, you'll need to stay a looooong while!